This topic contains 0 replies, has 1 voice, and was last updated by chris 2 years, 8 months ago. clean classic car, all the hard work is done. 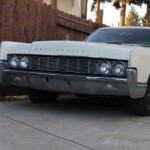 Air ride installed, 20″ Detroit steel wheels installed, Windows switches repaired, new carb… If you are looking for a turn key car please hit me up. Looking for $15,000 with wheels or $12,500 without. Bothe prices are OBO… See attached pics. 78,000 miles car, located in Nor Cal Napa area. 510-685-3669 please txt or leave msg. I cant upload pics but can send them via txt.